The Philippines isn’t really a wine drinking nation. But the fact is a lot more people are getting into it; ready to appreciate sans the stuffy stigma attached to it before. Whereas selection can often be daunting we can always look to Noel Ermitano’s notes on his site Eye On Wine for reference. His is probably the only local blog that objectively reviews wines (+food and other things alcoholic); and though tastes may differ, his yearly list of favorite locally available wines is always a helpful resource. How did you get into wine? Did you ever go through a time just drinking swill just to get drunk or did you always drink for taste? And of all the things to write about, why wine? My father has been into wine, as well as other drinks, for as long as I can remember. When we siblings were around 8 or 9 years old, our father would allow each a small pour with him during dinner if we wanted. Naturally, my brother and I always accepted to feel grown up. Things progressed from there. Dad would entertain at the house often when he was younger, so we’d filch whatever drinks, not just wine we could during the parties. There was always a lot of booze at home so we had easy access. I vividly recall one time, I was barely 12, my brother, a family friend, and I nabbed a bottle of Chivas Regal and killed it in the pool late at night during a Signal No. 2 typhoon. Yes, during those days and throughout high school, I’d drink whatever I could that was good, but to get blasted, when nothing else was available, I certainly wasn’t above making tagay Cuatro Cantos with my gang. Wine, however, was always for taste, during meals with Dad. To get drunk, scotch and the harder stuff got one there quicker, and, thus, cheaper as well. I continued having wine with meals after I got married and moved out in ‘92, but had to be more prudent and selective then since I had to start paying for my own, and young lawyers’ salaries wouldn’t allow for the better stuff. During that time, I’d have to wait for Dad to bring that over when he’d come visit. As times got better, I eventually got to buy the good stuff myself. In the meantime, I developed the habit of writing down what bottles I could afford and liked so as to be able to buy them again. That’s how the wine writing started. Because of loose notes’ tendency to get misplaced, upon a friend’s suggestion, I started my blog. As it is, I’ve managed to have lost around 3 years’ worth of wine notes altogether. I notice there is a lot of interest but people can easily get overwhelmed when in a wine shop and faced with so many choices. One can generally do a shotgun approach wherein you select a few bottles each time and figure out what tastes good but that can turn out costly over time. Any tips on a more efficient way of selecting a bottle? Go to the restaurants/shops that have oenomatic machines, such as CAV and Wine Story. Thereat, get by the glass to find out what you like, and note them down for subsequent bottle purchase at retail. Attend retailers’ wine tastings. They won’t pour you the expensive stuff, but one has to start where one can, right? Get a group of like-minded friends together and chip in on bottles for tasting. The youngsters these days are lucky that the wine scene these days allow such alternatives. Back then, it wasn’t that easy. Can you suggest 3 wines you’ve enjoyed under P1000? At that price range, whites and rosés are easy. Off the top of my head, any Spanish rosado or blanco from Terry’s Selection that suits one’s fancy would be under P500/bottle. When having tapas at Terry’s, I usually go for the Olarra Otoñal Rosado or, absent that, the one of Marqués de Cáceres is good enough (both are from Rioja). For a heavier rosado, try the garnacha-based Homenaje from Navarra. All those are around P400+/bottle. Reds, well, choices are narrow. I’d say the Abbotts Cumulus Reserve Minervois and the Zuccardi “Q” Malbec, both of which are sold by Terry’s at under P1000. Tough question. Whatever I’m enjoying at any given time, I guess. I don’t enjoy wine in a vacuum. Each bottle is taken into context of the time, place, occasion, meal, and company. That said, one of my more memorable wines is that bottle of 1986 Château Montrose that an old friend and I had at home late one night as we reminisced over the trouble we used to get into during our high school days. I’ve had many bottles of that wine before and since, with him and with others, but that particular bottle I will always remember. The wine was still youngish, under 15 years old, and a bit angular and quite tannic, but I loved it. Another would be a 1978 Château Pichon Lalande under the stars on a summer’s night at Château Siran with my wife and a few friends. Silken, deep, haunting bouquet of violets and cedar in dark plum and midnight fruit. I’ve had many bottles of the same since then, but that one was the best of them. What’s your favorite food and wine pairing? Another tough question. There are many, but grilled lamb chops and aged tinto Riojano gran reserva is one. Roast pigeon and mature red Burgundy is another. 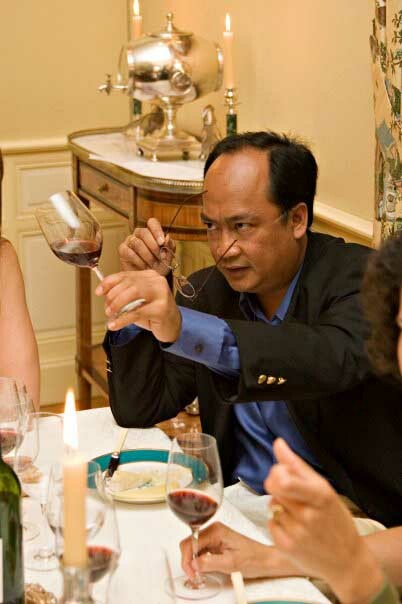 Does wine pair well with Pinoy food? Any successful pairings? Sure. I happen to think that rosés/rosados do very well for many Pinoy dishes; but you don’t have to take it from me. One I suggested for a Pinoy lunch in honor of a visiting Singaporean wine authority/celebrity/collector some years ago was the Homenaje Rosado paired with adobong agachonas (*ed’s note: snipe or kanduro; a game bird found in rice paddies). He really admired the pairing by all accounts. When you dine out do you go more for the food or the wine? What are your favorite restaurant’s here and abroad? Japanese – Hanakazu, Tsukiji, and, when it was still around, Sushi Kappo Kobikicho. Paris – l’Atelier du Joël Robuchon, Le Soufflé, Aux Lyonnais, and, for late night/early morning eats, Au Pied de Cochon. Burgundy – No contest – Ma Cuisine in the old town of Beaune. Alsace – Le Cerf (Marlenhein) and, for the quail and foie gras stew in particular, Au Tire Bouchon (Riquewihr). Bordeaux – Restaurants are not particularly great in Bordeaux, but I do like the one of Claude Darroze in Langon. Ribero Manera (Barcelona) – fantastic fresh seafood in a mall of all places. I have many favorites, but the only one I never miss is Thanh Long on Judah (SF, Ca). Keller’s Bouchon (Yountville, Ca) is also high up there. What’s your favorite junk food; your guilty pleasure? Ben & Jerry’s Double Chocolate Fudge mixed with Cherry Garcia.When it was still around, Sabrett’s spicy hotdog with sauerkraut, onions and mustard. What’s something that you’ll never eat (or eat again)? Though I do like morcilla and boudin noir, I won’t eat dinuguan. There was also this turtle and black mushroom soup I had at a lauriat once that took an extreme effort to hold down. Never having that again, I assure you. Is there any type of alcoholic beverage you can’t seem to enjoy? Anything gin-based. Gin doesn’t agree with me. Just between us, what are the future plans of Noel Ermitano and Eye on Wine? To grow old as gracefully as possible doing what I do now. Congratulations for a very nice article. I'm also a fan of Noel's Eye on Wine. This should be read by every aspiring winos and food lover. Keep up the good work. Noel's blog is good. Simple and not so glamorous like other blogs. Down to earth and humble pictures. I learned a lot about good resto from his notes. What's good about it too is that he always dine out with his family and friends, so its authentic. This is a good interview.